﻿ The Occoquan Craft Show Website - Back by Popular Demand! The Craft Show will include both contemporary and country crafters and artisans from Occoquan and from all around the United States. To stay informed of latest information updates on the Craft Show site as well as the latest events occurring within the Town of Occoquan, an RSS Feed is available for you to view by clicking on the RSS icon. The feed provides an opportunity for you to subscribe to it for free. 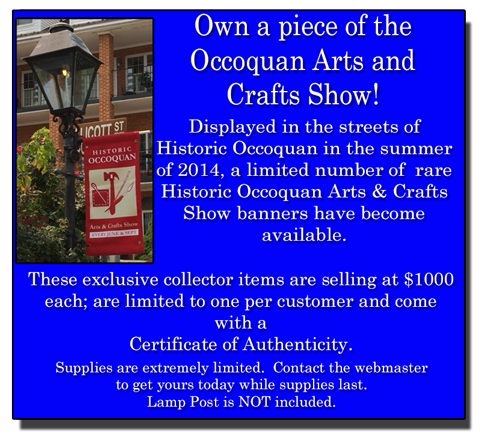 Between Craft Shows, you can see what is happening in Occoquan by accessing the Historic Occoquan web site and while visiting Occoquan, please stop by and visit one of our local merchants. 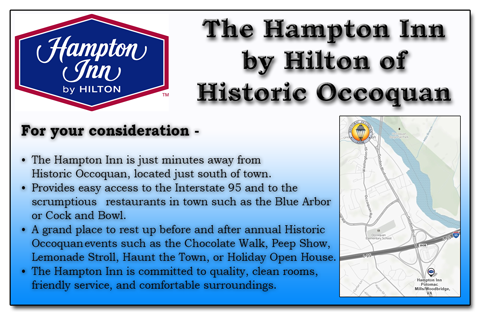 Click here for a complete list of hotels that are just minutes away from the show. If you are interested in craft shows and would like additional information about craft shows nation wide, below is a link the the premier art and craft show magazine for both exhibitors and buyers.